About a year ago, after finishing my Kikuchiyo-san book, I Used To Be You, i was finding it hard to be excited about anything. In hope of getting inspired, I went to a lot of bookstores and museums, but nothing much was happening in my mind. But one day I was flipping through a thick second hand Ikebana book at Mast book in East Village, and strangely it gave me a big rush of adrenaline. Ikebana and adrenaline doesn't seem to be a likely combination. Maybe I had too much coffee that day, but I felt excited again. After that, I enrolled in an ikebana class for six months. It turns out that ikebana has many rules to learn. I tried to follow the rules and create something meaningful at the same time, but my teacher finally told me, “Maybe you're not really cut out for ikebana”. Even so, I sometimes miss the class. In the small night classroom in midtown we were experiencing the tiny spring arrival fiddling with early cherry blossoms. The lovely (so I thought) Ikebana I made with cherry blossoms were eaten by our cat by next day. The chewed up cherry blossoms seemed like a reminder of the gap I sometimes experience between the art I want to create and my current chaotic everyday life. Okay, side tracked here again. 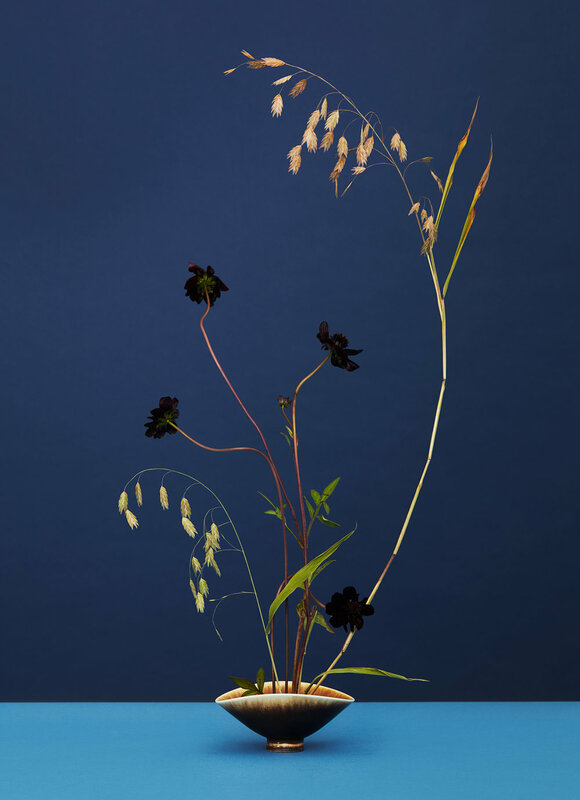 Big thanks to T Magazine, and the great flower artist we got to work with, Emily Thompson who also had created massive Ikebana. You can read the article for this shoot here.